Ariya and Moriya Jutanugarn tell LPGA moderator Kraig Kann which country will win the Crown. The eight teams that will play in next months’ UL International Crown at the Merit Club were determine via the world ranks a month ago. On Monday the four players who will compete for each team were unveiled. Players had until Sunday’s conclusion of the KPMG Women’s PGA Championship in Seattle to get their rankings high enough to earn spots on their national teams. There was only minor shuffling after the KPMG event. Amy Yang moved into the fourth spot for Republic of Korea and Porani Chutichai became Thailand’s fourth member. On the team side Australia passed Chinese Taipei to claim the No. 4 seed for the Crown, which is designed to determine the best women’s golfing nation. Korea seems a shoo-in, with its four players all ranked in the top eight in the world, but that’s not how Ariya Jutanugarn, the top player for No. 6 seed Thailand sees it. 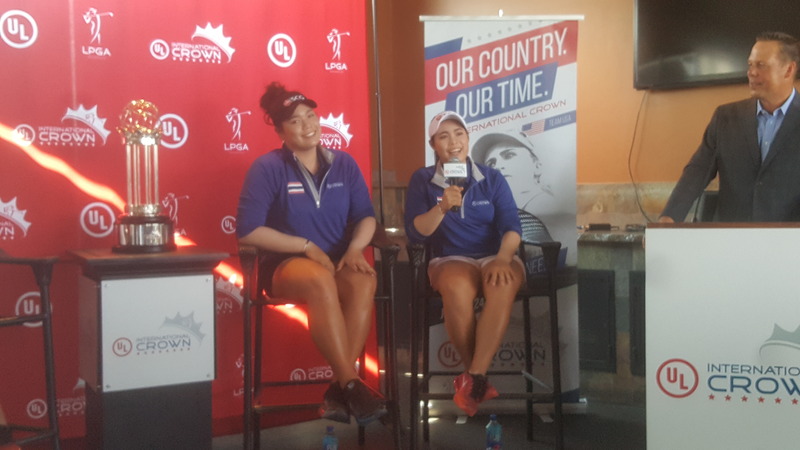 Last week in a Seattle press conference she declared that Thailand will claim the Crown and she repeated her prediction at Monday’s roster announcement at Top Golf in Wood Dale. “Why? Because we have a great team,’’ said Jutanugarn, one of four players on hand for the announcement. She was joined by her sister Moriya, who is also on the Thailand team; England’s Melissa Reid and China’s Shanshan Feng. Jutanugarn’s prediction drew a rousing cheer from 20 representatives of the Thailand Consulate of Chicago, who made their presence heard loud and clear throughout the announcement. 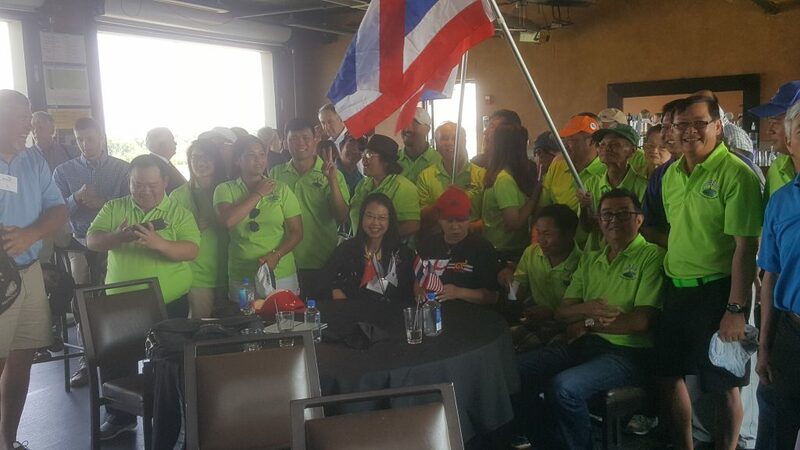 Thailand supporters turned out in force for the International Crown’s press conference. Ariya Jutanugarn, the longest hitter on the LPGA Tour, has climbed into the game’s elite with a No. 7 world ranking. She won three straight tournaments before finishing third at Seattle on Sunday The two who beat her – world No. 1 Lydia Ko of New Zealand and Canada’s Brooke Henderson, who beat Ko in a playoff for the KPMG title – won’t be in the Crown because their countries didn’t qualify. Neither did Spain, which won the Crown during the event’s first playing two years ago at Caves Valley in Maryland. Sweden, which was also among the eight teams at Caves Valley, also didn’t qualify this time. Instead England and China will play in the event for the first time at Merit Club. The U.S. team will be the No. 2 seed once the matches begin. The U.S. roster will have one change for the Crown debut in 2014. Gerina Piller is among the four and Paula Creamer is out. Piller joins Lexi Thompson, Stacy Lewis and Cristie Kerr on the U.S. side. With Ko and Henderson ineligible the top-ranked player in the Crown will be Korea’s Inbee Park of Korea, who is No. 3. Thompson is No. 4.